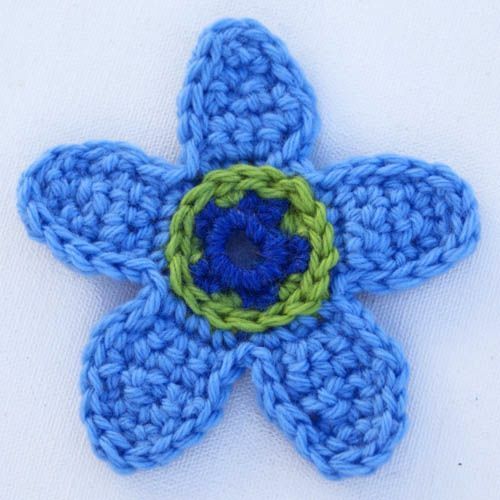 Need a free pattern for a crocheted flower applique? Try this one! This flower applique lies reasonably flat, making it ideal for stitching to a variety of surfaces. While there is some texture and dimension here, as there is with all crochet work, the real "oomph" comes more from the colorwork. In addition to the free crochet pattern, you'll find work-in-progress photos that show you how to do the color changes for the flower center. The finished flower will come in handy for use in many different types of craft projects. My sample is worked with Cascade 220, which is a worsted weight wool yarn. Feel free to substitute other colors, brands, fibers and weights of yarn when you crochet your own flower appliques. When choosing different colors, keep in mind that the color you choose for the flower center should contrast with the other two colors you'll be using. I used a size H / 5.0 mm crochet hook to crochet my sample flower, but you can use any hook that works well with your chosen yarn or thread. My sample flower measures about 4” in diameter across its widest point. Your flower measurement will vary depending on the supplies you use and other factors such as your individual style of crocheting. You'll be working with two different colors of yarn to create the flower center; one color will be inactive, and one will be active at any given time. There are a couple different ways you could handle the inactive yarn. You could just drop it when you're finished with it and then pick it up again when you need it next. This will result in small floats across the back of the work. Or, you could use the tapestry crochet technique to crochet overtop of the inactive color. You won't have floats this way, so if you want the flower to be two-sided this technique is preferable. Using color A, Ch 5. Sl st to form a ring. Round 1: Work 10 sc in ring. Sl st to join to first sc in the round. Round 2: In this round, you’re going to switch back and forth between colors A and B. Work 2 sc sts in each sc from the previous round – 2 sc in color A, 2 sc in color B, repeat all the way around for a total of 20 sc. To accomplish this, work the first sc as usual, but when you do the second sc, switch colors before you complete the stitch. (See photos above.) Sl st to join to first sc in the round. Cut color A and end off; do not cut color B yet. This flower has 5 petals total. Work the flower petals using color C.
Crochet the petals directly into the last round of the center of the flower. Work each petal separately before starting the next petal. Work through both loops of each stitch. I suggest taking a look at a photo of the flower with petals added before you actually start this part. Flower Petal, Row 1: Using color C, work 3 sc in any 3 sc sts from round 2. Flower Petal, Row 4: Sc in first sc, draw up a loop in next sc, draw up a loop in following sc, then YO and pull through all 3 loops on hook. (1 decrease worked.) Sc in next sc. Flower Petal, Row 5: Work 3 sc, 1 in each st across. Flower Petal, Row 6: Skip first sc, draw up a loop in next sc, draw up a loop in following sc, yo and pull through all 3 loops on hook. If working one of the first 4 petals, end off and weave in the loose end. For petal #5, do not end off. Begin the next flower petal by attaching color C to the flower center, leaving one st in between each petal. When you’ve worked all 5 petals, it will look like this. To make the flower center "pop," pick up color B and work a round of sl sts around the outer perimeter of round 2. (To get a better idea of how this looks when complete, you can compare this photo against this photo. You might also wish to view this tutorial about how to do surface crochet slip stitches. End off. Then pick up color C where you left off, and add slip stitches around the outer edges of your flower petals too. This isn’t going to be a precise process; there isn’t any obvious formula for where to put each stitch. Think freeform crochet here. Try to place your stitches as evenly and carefully as possible, keeping them close to the outer edges of the flower petals. This will tidy up the crooked-looking edges nicely so the outer edge of your flower has a smooth, uniform look. When you’ve worked sl sts all the way around, pull the loop left on your hook through your first sl st to the back of the work, then cut the yarn and end off. Weave in all your loose ends securely using a tapestry needle. This photo gives you a closer look at the unfinished flower applique. At this point, all the petals have been crocheted, but the final details have not yet been added. Visit the project introduction to see a photo of how the flower looks when it is complete.